As another year ends and a new one rolls in, it is somewhat apposite to reflect on the launch of another PASC inquiry into Whitehall which seeks to take stock of the Coalition’s Civil Service Reform Plan published in June last year. From Fulton onwards, ostensibly Whitehall appears to have been in a state of almost permanent revolution. 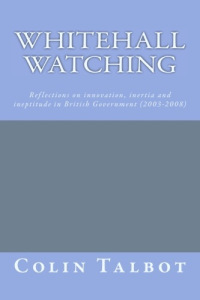 The list of initiatives by various governments in the intervening years is exhaustive, but any highlights programme would include: The Reorganisation of Central Government; Rayernism; FMI; Next Steps; Continuity and Change I and II; Modernising Government; Reforming Public Services; Transforming Public Service and The Governance of Britain. It is therefore of little surprise that the first question posed by this new PASC inquiry is deceptively simple – Is the Civil Service in need of radical reform? Yet, scratch below the surface and the answer to this small conundrum is by no means straightforward. For in many ways, the modern history of Civil Service reform can be characterized as Janus-faced. Why? Overtime, all governments have adopted a common default setting in their approach to this subject: on the one hand, a tendency to caricature the Whitehall machine as something akin to a ‘Rolls Royce’; while on the other, deriding its culture and organizational practices for constraining effective policy making, in terms of formulation, implementation, or both. The current reforms proposed by the Coalition appear little different. It is not clear whether reform is pitched at Whitehall as a monolithic organization requiring wholesale change, or something targeted more at specific parts of the service. The language invoked throughout proclaims a programme of ‘radical’ reform, resurrecting the ‘TINA’ aphorism of the 1980s: ‘this time there is no choice’ (Francis Maude p.4). Yet, as Colin has noted in one of his earlier blogs on this very theme [see 21 June 2012], the substance of the plan offers little more than a series of rather piecemeal, often unrelated proposals, or as he rather more pithily put it – Mostly Old Wine in Very Old, but Relabelled, Bottles. Part of the ambiguity reflects an unwillingness to clarify the role of the bureaucracy in the modern world, undertaking a realistic appraisal of its capabilities. It is difficult to establish the case for reform, where there is a lack of over-arching vision of what the civil service is and does. The emphasis should be less on what the civil servants already does well, managing upwards, and more on what is often overlooked: the ability to effectively manage downwards in delivering policy. There are evidently points of good sense in the plan, notably a commitment to upgrading training and development, improving information management and introducing a coherent digital strategy for UK government. There is some acknowledgement that a considerable amount of Whitehall policy-making is weak and ineffectual. However, there are a number of areas where the proposals may not lead to beneficial changes and, indeed, could result in unintended consequences. First, there is no overall vision about what the future role of the state should look like. The data published to support the reform plan emphasizes the long-term challenge of fiscal sustainability, and the need for significant cuts in departmental expenditure up to 2015-16 to achieve the government’s commitments on deficit reduction. There is also a recognition that the civil service will have to respond to complex social and environmental challenges, in particular an ageing society and climate change. Yet the plan fails to articulate what sort of role and capacity government should provide to help meet these challenges. It approvingly notes that civil service employment now constitutes less than 2 per cent of total UK employment, the lowest level since 1945. The reduction in civil service employment since 2010 is greater in two years than that achieved between 1979 and 1990. But it also raises fundamental questions about the long-term capacity and sustainability of the civil service. The recent policy ‘fiasco’ over the West Coast mainline franchise process draws such questions into sharp focus. For example, it highlights wider concerns surrounding the policy-making capability within the Department of Transport (DfT) following a series of departures among senior staff. Similarly, the former Chancellor of the Exchequer, Alistair Darling (2010), alludes in his recent memoirs to the lack of experience and expertise in the Treasury which compromised the quality of support and advice he received in navigating a pathway through the 2008 financial crisis. The process of ‘slimming-down’ has accelerated across Whitehall since 2010. None of these debates about the role and function of the state are properly aired within the civil service reform plan. Second, the reform plan alights on particular national models without exploring the underlying tensions and ambiguities involved in exporting reforms from one country to another. Indeed, the Cabinet Office minister Francis Maude has gone on record in announcing that the government is particularly interested in the ‘New Zealand’ model based on a contractual relationship between ministers and departmental chief executives. The advantages of the New Zealand system are that senior officials are publicly accountable for performance, resolving the underlying tension in many ‘Westminster-based’ democracies between whether ministers or civil servants are responsible for operational decisions and delivery. There are, however, a series of ambiguities that emerge in the UK context. For example, such a model might entrench the artificial distinction between ‘policy-making’ and ‘implementation’. In clarifying ministerial and civil service accountability, there is a risk that policy-making and implementation will be prised even further apart. Third, the plans consider the role of the civil service in its own right, without considering its wider relationship to public services. The modern day civil service does not operate in isolation, delivering policy in a hierarchical, top-down fashion. The civil service reform plan acknowledges weaknesses inherent in the current architecture of Whitehall policy-making. However, there is still a tendency to treat policy formulation as a linear process of transmission from central government to local agencies and actors. Yet scores of ministers over the last thirty years have voiced their frustration at pulling what they regard as ‘rubber levers’, compounded by the fact that their control over institutions beyond the central state is circumscribed. Fourth, despite the obvious imperatives of fiscal consolidation providing a clear window of opportunity for change, more radical options for Whitehall reform appear to be off the agenda. For example, a lack of ‘joined-up’ government and departmentalism has been a perennial concern in Whitehall since the 1940s. There is a case for re-examining departmental boundaries and ‘silos’, re-organizing Whitehall round a series of ‘outcomes’ that weaken or even abolish departmental boundaries. Elsewhere, the plan should be applauded for advocating a shift towards more open policy-making, drawing on more ‘expert’ and ‘non-expert’, outsiders. Yet at the same time it is not willing to countenance challenging the holy grail of Whitehall’s modus operandi – the disclosure of minister-civil discussions. There is no evidence to suggest that such a move would curtail the willingness of officials to speak truth unto power. Indeed conversely, it might well have the oppose effect, enhancing the quality of officials’ critical engagement in the policy process knowing there is the spotlight of public scrutiny. Here again, one could flag the events surrounding the West Coast Mainline as a case in point. So, the short answer to PASC’s question of whether or not Whitehall requires radical reform is then, rather frustratingly both yes and no. Yes, if there is a real willingness to reappraise a number of the core tenets of the Westminster model, but no, if it simply involves another bout of grafting reform onto a settlement that has been hanging round for far too long. It is of course not difficult to work out which of these two routes the current Coalition is heading down, despite its somewhat overblown rhetorical claims. On this rather sobering note that we would like to toast a Happy New Year to all the readers of Whitehall Watch with of course a fine bottle of claret! David Richards is Professor of Public Policy, University of Manchester and author of New Labour and the Civil Service: Reconstituting The Westminster Model Basingstoke: Palgrave. Patrick Diamond is a former Special Adviser in the last Labour Government and currently a Post-Doctoral Research Fellow, Politics, School of Social Sciences, University of Manchester. ← Some more figures for you: “We have got the deficit down by 25%” – really?